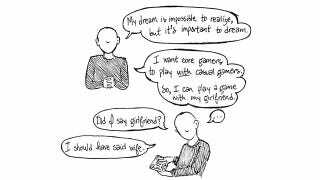 Our GDC cartoonist Elizabeth Simins got to interview Peter Molyneux earlier today. Most Peter Molyneux interviews you will see involve loads of text, or video, or audio. This one involves a comic. It really captures the quirks of interviewing someone professionally; you're expecting a very business-like procedure to take place, but it's the little things that, like anyone else you're meeting for the first time, make as much of an impression as the official answers to your official questions. Writer/artist Elizabeth Simins will be hanging out at GDC all week, filing comic strips each day to chronicle her adventures at the show. We'll be running her GDC strips all week at Kotaku to give you something of a GDC comic strip diary. You'll also be able to find them under the tag Game Developers Comics 2014.